We are delighted to inform you that His Holiness the Dalai Lama has generously accepted our invitation to continue his teachings for the Baltic States and Russia. The next cycle of teachings will take place in Riga, Latvia, in June 16th-18th 2018. This time His Holiness chose to discuss a wisdom side of the spiritual path. On June 16 and 17 mornings, His Holiness will teach on Tsongkhapa’s In Praise of Dependent Origination (tendrel toepa) and Diamond Cutter Sutra (dorjee chodpa). 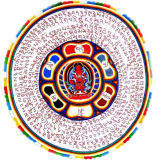 On June 18 morning, he will confer a Manjushree Empowerment (jamphelyang jenang). In Mahayana Buddhism spiritual practice is based upon six «perfections» (paramitas). The first five of them - giving, morality, patience, joyful effort and meditation - are qualified as «method», while prajnaparamita, perfection of understanding of emptiness, belongs to the wisdom side of spiritual practice. In order to follow spiritual path in a correct manner, method and wisdom must be combined. The Diamond Sutra cutting off all the delusions is a powerful means to realize emptiness, interdependence of all things. To receive an a commentary on the Diamond Sutra and empowerment of Manjushri, the Buddha of Wisdom, from such an outstanding spiritual master as His Holiness the Dalai Lama is a very rare opportunity to get a taste of direct realization of emptiness so much needed to achieve Buddhahood. His Holiness the Dalai Lama teachings for the Baltic States and Russia have been held in Riga since 2014 and are open to everyone, both Buddhists and those who are simply interested in the Buddhist philosophy that harmoniously combines profound wisdom and limitless compassion. We will be happy to meet you again! What are the commitments for empowerment of Manjushri? Which tantra class? How many mantras a day? Anyone? I'm going to watch webcast. I've just spoken to a friend who is attending in person, the commitments haven't been announced but His Holiness is giving an 1000 armed Chenrezig Wang and a Manjushri Jenang.